First singles spun on my Minispinner on the bobbin to the right. Shetland from FridayStudios, custom dyed for me. It's 100 grams, and I have 100 grams to spin for the second singles. I don't know if I'll make a 2-ply yet. 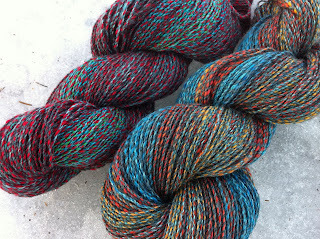 The singles is 30 WPI, so a 2-ply would be a nice lace yarn. In the middle a 3-ply BFL-silk, and to the left my first attempt to spin cotton on Louet Victoria. I'm as happy as yesterday. Oh - the WPI gauge is a gift from a Swedish spinner. I love it! I had given up hope for today and started cooking pasta for lunch and baking cookies when the postwoman drove up on our yard. Package! Package! Eeeeh! From HansenCrafts. It's beautiful. It's so well manufactured. It's small. I love it. The wood is cherry. The WooleeWinder bobbins are HUGE! I love the WooleeWinder too. I'm spinning Shetland. The other bobbins on the kate are the small high speed bobbin, and the bigger standard bobbin for Louet Victoria. Katsokaa, jos ette jo ole ihailleet tätä: Kehrääjän käsikirja. Olen hirvittävän onnellinen tästä kirjasta, vaikka en tietenkään vielä ole sitä nähnyt. Olen tehnyt ennakkotilauksen. New book on handspinning to be published in Finnish in April! Makes me very very happy! You can find the author as "Tuulia" on Ravelry. Ny bok om spinning på finska i april! Åh vad glad jag är! Jag beundrar Tuulia och hon beundrar mig :) Här är hennes hemsida: Tuulia och Louhittaren Luola med några väldigt bra stickmönster.